Scientists are often wary of engaging with the messy business of politics for a variety of reasons. But their understanding of and participation in the policy-making—and hence political—process is necessary if they wish to provide their important perspectives on some of our most critical and contentious issues. This past March, a group of scientists from three continents published “Empirically derived guidance for social scientists to influence environmental policy” in the journal PLoS One. The article combined 348 years of cumulative experience to guide social scientists on how to influence science policy. They placed at the top of their list “acquire policy acumen.” We thought this an important task for any scientist, including ourselves, so we put together a policy primer. (And this allows us to return to a previous footnote regarding the myth of capital-P policy). We’ll walk through the difference between policy and politics and a few real and imagined examples of both as they relate to science policy. As noted by many scholars and practitioners (e.g., John W. Kingdon, Robert A. Pielke, Jr.), there is a distinction between politics and policy. A policy is a decision; policies define a path forward or a course of action for a government or other institution. In the United States government, policies are often crafted and edited by groups of politicians. Therefore, policy is often the result of politics, the collective process of negotiation and compromise among politicians, lobbyists, agencies, and citizens. To illustrate these definitions, let’s walk through a (relevant!) example: the policy and politics of the science budget. Such visualizations of the science budget oversimplify a policy-making process that is actually quite complex. They imply that the science budget is decided as a whole, when really it’s decided in many pieces by myriad players. In fact, the number of players and the number and nature of the complex interactions among them could be the subject of an entire thesis project; we’ll only scratch the surface. The first, obvious key players are the President and his administration. Presidentially appointed executives, directors, and secretaries go back and forth with the President over the best funding outcome for their respective agencies. (Typically, everyone wants a funding increase over the previous fiscal year.) 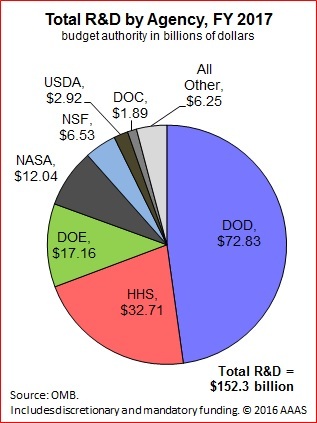 Some of these agencies do not spend any money at all on science or R&D; for others, research may comprise a large portion of their budget. But it’s important to keep in mind that R&D is a small fraction of the overall federal budget—3.5 percent in 2016. The Office of Management and Budget is the ultimate broker of these executive branch negotiations; they know the budgetary constraints of federal revenues and outlays, and impose them. The other set of obvious players is the Congress, particularly the elected representatives who sit on Appropriations Committees in the House or Senate. Although the President submits his budget to Congress, it is ultimately up to these multiple committees and their members to decide where the funds will flow. More often than not, they have a different idea of how money should be dispersed (even among themselves; for example, see comments on President Trump’s so-called “skinny budget” from House Speaker Paul Ryan and Senate Majority Leader Mitch McConnell). In addition, there are countless lobbyists, advocates, and institutions that weigh in, using whatever leverage they have, to seek advantages for their constituents. So rather than “The Science Budget,” the policy in the case of science funding consists of an appropriations bill that is underwritten by scores of negotiations, proposals, requests, and other policies (such as executive or secretarial orders) from all these different sources. A mess of players have skin in the game. So of course there are science budget politics. Perhaps most visibly, the executive branch will fight with Congress over appropriations choices that represent policy priorities. (The American Institute of Physics releases tables and charts illustrating this phenomenon. See an example for the U.S. Geological Survey here.) But it goes far deeper. For example, outside of the expected discourse between the White House and the executive agencies, the agencies have liaisons to Congress: they know who really holds the purse strings. Lobbyists and other advocates also hover about, challenging agencies, representatives, Congressional staffers, anyone with ears, to prioritize their pet issues. For instance, disease advocates, healthcare providers, and biomedical researchers are champions of National Institutes of Health funding, and enjoy strong public support that gives them bargaining power. Within each of these entities there is a lot of politicking. On Capitol Hill, for example, there are negotiations between the two houses of Congress, among the members of each chamber, among the members of each relevant committee, and even among the members of committees that oversee the non-budgetary aspects of executive agencies. The major takeaway from our example of federal funding for science is that there is no one policy or politics that defines the federal science budget. Laws are layered, decision makers are ideologically and culturally diverse, and our government is designed as a heterodoxy. No single group or idea continuously prevails, leading to diversity and competition for resources across time, even in science-budget politics. Organizations like AAAS create pie charts and such showing a single budget representing a single policy, but these are more descriptive-analytical constructs than reflections of policy decisions. Likewise, many writers, bloggers, and scientists have argued that the Trump administration is waging a war on science by defunding important science agencies and institutions. This implies that there is a single political conflict between science and Trump that plays out in the budget. There’s not. As we showed above, the process of funding science across the federal government involves thousands of moving pieces and lots of negotiation. Our insistence that there’s no single capital-P science-budget policy might come across as overly semantic. But this point is critical to 1) shaping future science-budget policy, and 2) understanding that politics shouldn’t be considered a bad word in science. Addressing science-budget policy as capital-P policy masks the processes that make it and thus misdirects conversations about and efforts to change science-budget policy. Representing science-budget policy, or any forms of science policy, as multiplicative and diverse, on the other hand, better represents the political process and allows for targeted conversations and efforts to be successful. What if There Was a Capital-P Policy for Science? Let’s take another example, but this time a hypothetical one: what if there was one budget for federally-funded science that was passed in a single bill? Let’s call it the Science Budget Bill of 2017. The debates and political theatre around issues like climate change or ideological objections to some social sciences would no longer be isolated to individual committees on the topic or related bills and agencies. Those partisan issues would take center stage in debates on the Science Budget Bill of 2017, holding up action on the vast majority of federally funded research that does have bipartisan support. There’s certainly precedent for this type of bill. The Farm Bill agglomerates agricultural policies, crop insurance and other safety nets for farmers, and nutrition programs like food stamps. In one sense, lumping liberal-supported food stamps with conservative-supported industry initiatives is smart politics: considering them together could force each side to make concessions and pass the bill. But it also opens up the possibility that one side holds up passage on ideological grounds regarding one portion of the bill, preventing action on any of the numerous programs in the larger bill. The latest iteration of the Farm Bill, passed in 2014, faced this problem due to pressure from conservative groups. Congress passed the legislation two years after the prior farm bill had lapsed. Our hypothetical Science Budget Bill of 2017 could face similar conflict and delay. 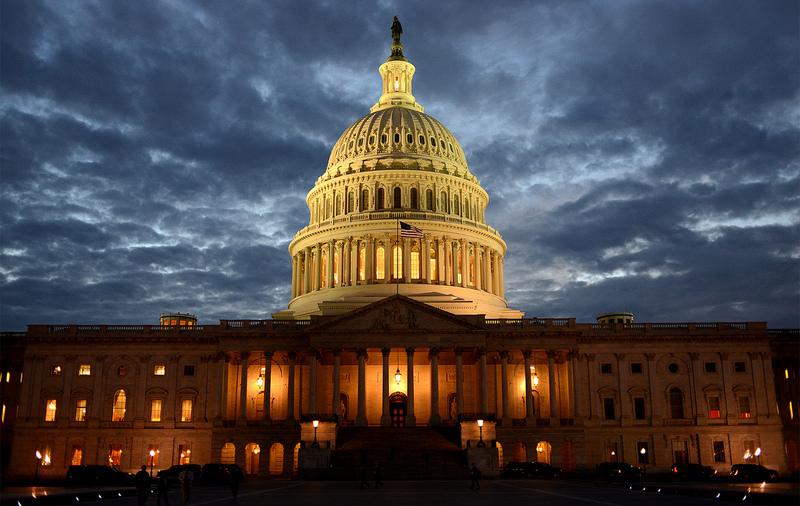 Beyond the political logistics of getting an omnibus science bill passed, a single policy and budget for science would disconnect science from the various public goods it is funded to support. Accountability and responsiveness to public concerns would be lost because all federally funded science would be funded because it’s science in the science bill, not because of its (potential) links to public goods. A recently passed bill intended to modernize and promote technology transfer in NOAA’s forecasting endeavors, for example, would be reframed as a few budget lines for forecasting science, a small part of a massive general science bill. But this might undermine the public good this funding is intended to promote: protecting lives and property from weather-related harm via better forecasting. In our hypothetical scenario, then, politics poses a huge risk to all federally funded science by hamstringing the process by which it is funded and disconnecting science from public goods. In reality, politics are critical to federally funded science, hence the group of scientists we cited above suggests scientists brush up on policy! There are at least three important reasons for scientists and other citizens to engage in the messy, complex political machinations behind any science-related policy. First, politics are necessary just to reach decisions about what science to fund. There are seemingly unlimited types of research we could fund, but the United States has a limited budget and the government must make decisions about what it should fund. Second, politics in the context of a fragmented science policymaking landscape prevents any one person, group, or idea from overtly dominating the process. This is the wisdom behind the separation of powers and federalism stemming back to the country’s founding. Third, political debate around science ensures that questions of public costs and benefits can influence decision making. Do the costs of certain scientific or technological discoveries outweigh potential benefits? This is a question of values and politics, not methods and theory. We publicly fund science in the United States for more than the awe of discovery. Politicians, agencies, and scientists justify science in terms of the public benefits connected to it. And if we are talking about public money spent for public benefits with potential public costs, we are talking about democratic politics. Scientists and those who care about publicly funded science definitely need to “acquire policy acumen,” in the words of the august group cited above, if they wish to influence the science budget and science policy more broadly. Michelle Sullivan and Nicholas Weller are PhD candidates at Arizona State University. This post was originally published on their blog.